-4- available space in the Hawkeye Trailer Court two days after the matter was brought to the attention of the Commission. The conclusion of the two man committee was that the party involved had probably not made every effort to find a place, but this may have been due to the discouragement incurred in being turned down in the places where he did check. Nothing conclusive was established relative to the existence of discrimination in the trailer courts of the area. The third case of discrimination was not investigated since the party complaining of this discrimination failed to present her complaint formally with the Commission or its members, and also left the Community before giving the Commission a formal complaint. 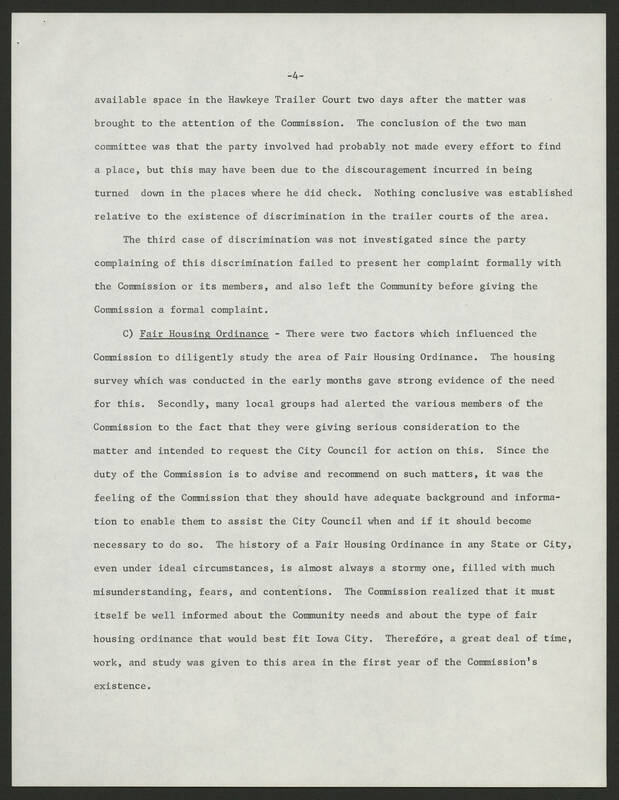 C) [Underline] Fair Housing Ordinance[End Underline] - There were two factors which influenced the Commission to diligently study the area of Fair Housing Ordinance. The housing survey which was conducted in the early months gave strong evidence of the deed for this. Secondly, many local groups had alerted the various members of the Commission to the fact that they were giving serious consideration to the matter and intended to request the City Council for action on this. Since the duty of the Commission is to advice and recommend on such matters, it was the feeling of the Commission that they should have adequate background and information to enable them to assist the City Council when and if it should become necessary to do so. The history of a Fair Housing Ordinance in any State or City, even under ideal circumstances, is almost always a stormy one, filled with much misunderstanding, fears, and contentions. The commission realized that it must itself be well informed about the Community needs and about the type of fair housing ordinance that would best fit Iowa City. Therefore, a great deal of time, work, and study was given to this area in the first year of the Commission's existence.